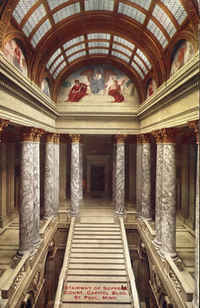 The Beaux-Arts-inspired American Renaissance design of the Minnesota State Capitol was influenced by McKim, Mead & White's Rhode Island State Capitol (begun two years earlier), the U.S. Capitol, Library of Congress, and the dome of St. Peter in Rome, as well as Italian Renaissance architecture generally. [Gilbert's annotation of the Francis Swales article, "Contemporary Architects and Their Work: Mr. Cass Gilbert of New York and St. Paul," The Builder, January 12,1912, LOC-CGP.] Previous Capitols evolved from Colonial architecture, focusing on Greek details, often including one or more Greek temple facades or porticoes. Often they were capped with a small dome or cupola. Another strain of Capitols was derived from "High Victorian," which brought Italianate details into the composition. The Rhode Island and Minnesota capitals introduced American Renaissance architecture to capitals and set the direction for many years to come. The Minnesota State Capitol is the project that propelled Gilbert onto the national scene. At the same time, it is the first project in which the national scene played a significant role in Gilbert's choice of design idioms. 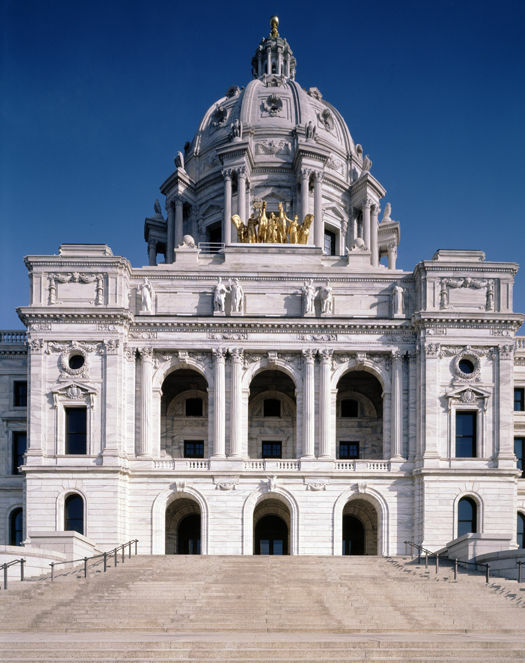 Gilbert succeeded in the Minnesota State Capitol competition through epic efforts at networking and architectural genius, the culmination of years of work and determination. After obtaining the commission, Gilbert traveled to Europe, seeking design inspiration. He also hired a team of experts, including Gunvald Aus, a Norwegian-born engineer known for his innovative work. Still, Gilbert found a place on the capitol project for William Truesdell, with whom he had worked on a surveying crew the summer before Gilbert started at MIT. Rafael Guastavino, another expert, was a pioneer in the design of fireproof construction. Guastavino had revolutionized the design and construction of buildings with large spans by introducing the "Catalan vault" to America in the late 1880s. The contractor was Butler Brothers. 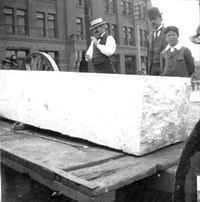 The commission for the Minnesota State Capitol made Gilbert's reputation. Because the project started slowly and moved forward slowly, his income from it did not provide a cure for his family's financial problems. It did not even provide the means to keep his office staff together. In 1898, Gilbert laid off George Carsley. 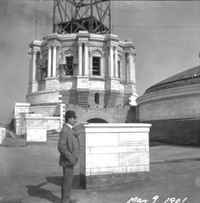 Carsley was hired by James Record, an engineer and contractor who won a contract for work on the Capitol. [George Carsley to CG, April 13,1898, Box: General Correspondence, January 1896-June 1899, MNHS-CGP.] When better times returned, so did Carsley, and he would eventually become the key employee in the St. Paul office when Holyoke, head draftsman for the capitol, left Gilbert's employ.